Goel A*, Walasangikar VB*, Pawde A**, Chauhan AR***. Unicornuate uterus with a rudimentary horn is the rare congenital anatomic anomaly of the female genital system (incidence of 1/100,000), causing many obstetric and gynecological complications. We report a case of huge hematosalpinx secondary to unicornuate non-communicating horn presenting as lump in abdomen in a teenage girl. The reported incidence of congenital uterine anomalies is 0.5 – 1%. Unicornuate uterus is classified as Type II mullerian duct anomaly by the American Fertility Society. The rudimentary horn is connected to unicornuate uterus with a fibrous or fibromuscular band in 10-15% of cases. The diagnosis of this anomaly is usually delayed, as it remains asymptomatic and initial symptoms are non-specific. It may be diagnosed due to complications such as hematometra, endometriosis, infertility and ectopic pregnancy. A 14 year old girl presented with dysmenorrhea for last 6 months and pain in abdomen for last 3 months, both of which had increased in intensity for last 2 months. The pain started a day prior to menses, continued during menses and was associated with vomiting. She also complained of a lump in the lower abdomen for last three months. She had attained menarche at the age of 11 years and her menstrual cycles were regular. On examination, general and systemic examinations were normal. On abdominal examination a firm, non-tender, irregular and immobile mass arising from the pelvis in midline was palpable corresponding to 18-20 weeks’ uterine size. Speculum and vaginal examination was not done as the patient was unmarried and hymen was intact. The patient was not willing for rectal examination. Our clinical impression was ovarian cyst or more unlikely, a large endometrioma. Ultrasound was suggestive of a uterine horn on the right side in pelvis with normal size, shape and normal endometrium, but with a displaced axis. Another uterus- like structure was seen on left side at a higher location suggestive of second horn with contents within the endometrial cavity with fluid levels and echoes suggestive of hematometra. This was seen to be draining into a large elongated tubular structure (20 x 15 x 7 cm) with partial septae with echoes within it, most likely representing hydro- or hematosalpinx. Bilateral ovaries were normal. Mild hydronephrosis and hydroureter of left kidney were seen; right kidney was normal. Her routine hematological and biochemical investigations were within normal limits. CA 125 level was not elevated indicating non endometriotic/ benign lesion. 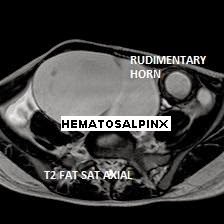 Magnetic resonance imaging (MRI) was suggestive of bicornuate uterus with obstructed left horn not communicating with the cervix resulting in hematometra and hematosalpinx. Left horn was displaced anterosuperiorly abutting the anterior abdominal wall in left iliac fossa and normal appearing right horn along with cervix was seen in situ. Figure 1. 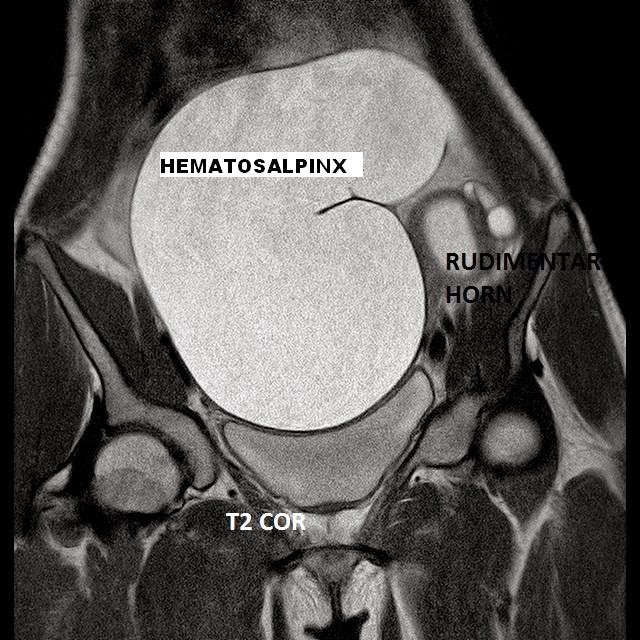 T2 weighted coronal MRI image showing unicornuate uterus in communication with hematosalpinx. Figure 3. 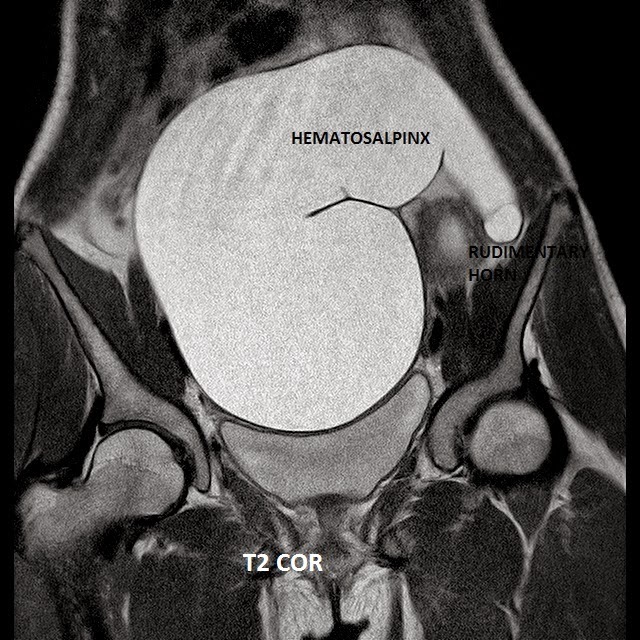 T2 weighted coronal MRI image showing unicornuate uterus and hematosalpinx. 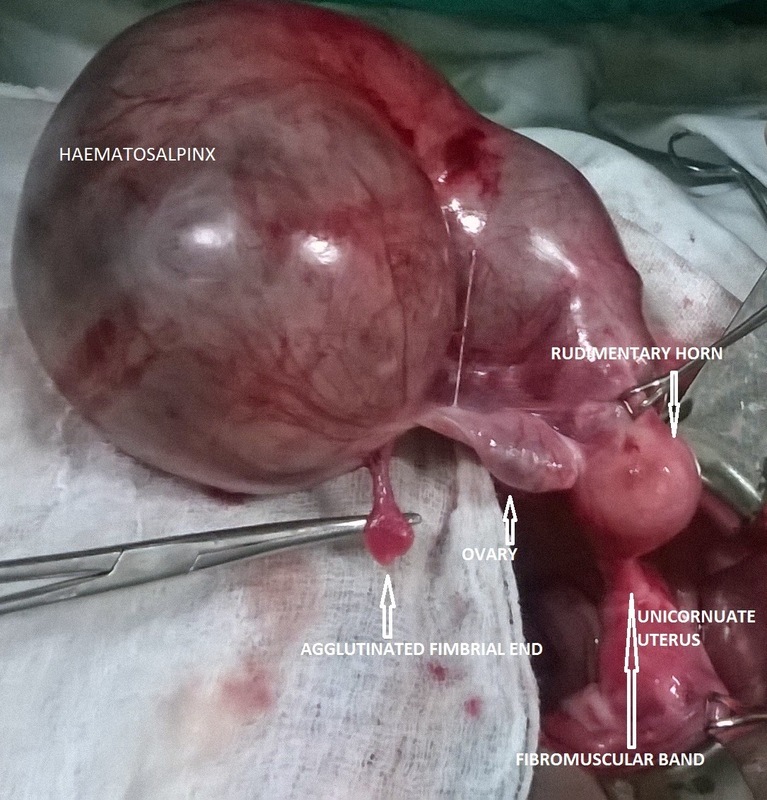 On exploratory laparotomy, a unicornuate uterus was seen in continuation with a normal functional cervix on the right side. Right fallopian tube and ovary were normal. Left rudimentary horn was seen connected to the uterus with a fibromuscular band. Left fallopian tube was retort shaped, distended, tense, 16 x 10 x 8 cm in size, lying anterosuperior to the rudimentary horn with agglutinated fimbrial end. It was class [FaL 16 cm - UtR 5 cm Fn NoObst - UtL1 3 cm Fn Obst (left hematosalpinx)] by the new EAC classification of congenital malformations of the female genital Tract. Figure.4 Intraoperative image showing unicornuate uterus, fibromuscular band, rudimentary horn in communication with left hematosalpinx with agglutinated fimbrial end and left ovary. Excision of left rudimentary non-communicating horn with salpingectomy was done: left round ligament was clamped, cut and transfixed; fibromuscular band was clamped, cut and transfixed using polyglactin No.1. A window was created in the broad ligament and mesosalphinx was dissected by sharp dissection. Left ovary was separated from the rudimentary horn by sharp dissection and cauterization. Left ovary with its vascular pedicle was conserved. Successive clamps were applied in the meso-salpinx to remove the left rudimentary horn with hematosalphinx. Extra-peritonization of broad ligament stump and left round ligament was done. Figure 5. intraoperative image showing unicornuate uterus and conserved left ovary. Post-operatively the patient recovered uneventfully and resumed normal cycles and without dysmenorrhea. Histopathology report confirmed a rudimentary horn showing pre-pubertal changes with left sided hematosalpinx. The differential diagnosis of acute abdominal pain in adolescent girls should include mullerian anomalies. Although the incidence is low, evaluation and treatment should be performed expeditiously as the conditions can pose risk to life or future fertility. Although hematosalpinx is not common in teenage years, its prompt treatment is needed. Physical examination may not diagnose these anomalies accurately; imaging modalities such as ultrasound, Hysterosalpingography HSG and MRI are important tools for diagnosis. Typically, HSG films show a deviated banana-shaped cavity with a single fallopian tube, Hematosalpinx is also diagnosed accurately with HSG. Rudimentary uterine horn in association with a unicornuate uterus is best diagnosed by sonography. MRI is useful for early diagnosis. As unicornuate uterus with functional uterine horn is associated with complications such as endometriosis, infertility, ectopic pregnancy; excision of a cavitary rudimentary horn is indicated. Whereas, excision of nonfunctioning horn (solid, with no functional endometrium) is not routinely recommended, as no adverse effects are reported. Salpingectomy or salpingo-oophorectomy on the side with the rudimentary horn, however, has been suggested to prevent ectopic pregnancy in women with a unicornuate uterus. Hematosalpinx in unicornuate uterus secondary to backflow from an obstructed horn leading to endometriosis as well as adenomyosis is known. However, occurrence of a large hematosalpinx like in the case presented here is rare due to limited capacity of the fallopian tube to distend as well as its communication with the peritoneal cavity. Such huge hematosalpinges tend to undergo torsion, though this was not seen in our case. Exploratory laparotomy with de-torsion of hematosalpinx may help to conserve the tube. However in our case, large size as well as agglutinated fimbriae warranted salpingectomy along with excision of non-communicating rudimentary horn. Atmaca R, Germen AT, Burak F, Kafkasli A. Acute abdomen in a case with non-communicating rudimentary horn and unicornuate uterus. JSLS 2005; 9(2): 235–237. Khanna V, D'Souza J, Tiwari SS, Sharma RK, Shrivastava AK. Unicornuate uterus with an obstructed rudimentary horn: A report of two cases with an imaging perspective Medical Journal Armed Forces India. 2013; 69(1): 78–82. The American Fertility Society. The American Fertility Society classifications of adnexal adhesions, distal tubal occlusion, tubal occlusion secondary to tubal ligation, tubal pregnancies, Müllerian anomalies and intrauterine adhesions. Fert Ster. 1988; 49:944–955. Goel P, Aggarwal A, Devi K, Takkar N, Saha PK, Huria A, Unicornuate uterus with non-communicating rudimentary horn – different clinical presentations, Journal of Obstetric Gynaecology India 2005;55: 155-158. Szkodziak P, Woźniak S, Czuczwar P, Paszkowski T, Milart P, Wozniakowska E, Szlichtyng W. Usefulness of three dimensional transvaginal ultrasonography and hysterosalpingography in diagnosing uterine anomalies. Ginekol Pol. 2014 May; 85(5):354-9. Fujimoto VY, Klein NA, Miller PB, Late-onset hematometra and hematosalpinx in a woman with a non-communicating uterine horn A case report. J Reprod Med 1998;43(5):465-7.